The LDS Temple at Florence, Nebraska is the 104th temple of the Church of Jesus Christ of Latter-Day Saints. Its impressive size (16,000 sq. ft) defy the facts that it took only 16 months to complete. It had its open house from March 30th, 2001 to April 12th, 2001. It was dedicated on April 22nd, 2001. The initial groundbreaking started on November 28th, 1999 following the announcement on June 14th, 2001. 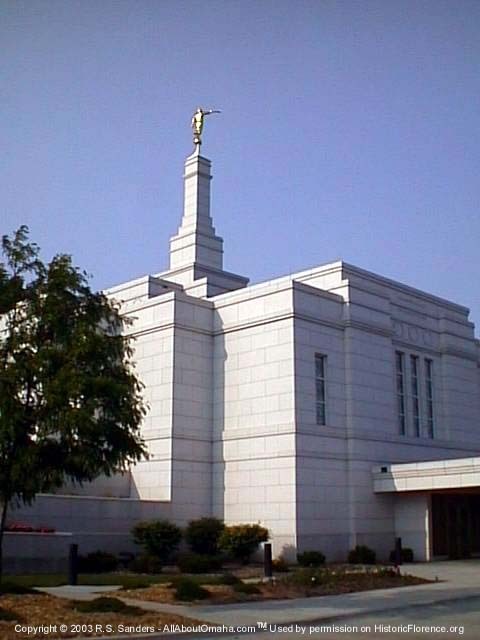 Over 61,000 people visited the new temple from April 2nd to the 14th, 2001. The temple at Florence, Nebraska serves more than 35,000 Latter-Day Saints who live in the temple district. The temple covers these stakes (similar to a diocese): Ames, Iowa; Council Bluffs, Iowa; Des Moines, Iowa; Kearney, Nebraska; Lincoln, Nebraska; Omaha, Nebraska; Papillion, Nebraska; Platte City, Missouri; Salina, Kansas; Sioux City, Iowa; Sioux Falls, South Dakota; and Topeka, Kansas. The exterior facade of the temple is made of Bethel white granite. There are 18 stained glass windows, several depicting a scene or site of the Winter Quarters era. The gold statue at the top of the temple is of the angel Moroni (Mo-RONE-eye). The entrance to the temple is through two large brass doors decorated with floral designs. On the inside, there is a celestial room, endowment room, two ordinance rooms (seating capacity of 40 persons each). There is also two sealing rooms, reception room, a baptistery, and offices. There are also service areas for laundry, an eating area, and dressing rooms. In the main areas, the furniture is handcrafted period-style, and the walls have original artworks including oil painting of Winter Quarters, the Missouri River, and the Nebraska landmark of Chimney Rock. A handmade period-design quilt covers another section. The Florence Temple has historic significance, built on 1.92 acres of land next to the Pioneer Mormon Cemetery where over 600 members of the church are buried. Today, you can visit the Mormon Trail Center (across the street from the temple) at 3215 State St, a monument to the trials and tribulations of the early pioneers. In a free guided tour, you can see an example of a primitive log cabin, ox drawn covered wagon, hand-carts, and many other artifacts of the era. A guided tour starts with a short film that helps tell the story in a way that you cannot forget. The cemetery has a large bronze statue of a couple burying their infant child. The Florence Temple architect was Dan Reinhardt of Reinhardt & Associates, and the temple was constructed by Lund-Ross Constructors, Inc.